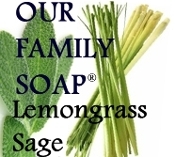 The combination of Lemongrass and Sage is clean, fresh and uplifting! Relaxing to your mind while leaving your skin clean, and soft. Saponified Olive oil, coconut oil, palm oil, lemongrass sage eo blend, coco butter and Vitamin E.